Official visit by Head of State Nursultan Nazarbaev to the Federal Republic of Germany is being continued. The President of Kazakhstan visited the Bundestag of the FRG and met with its President Norbert Lammert. Important issues of bilateral collaboration and strengthening parliamentary ties were discussed during the meeting. An excursion was held in the Bundestag after the negotiations. The President of Kazakhstan viewed Berlin's panorama from the dome of Bundestag. 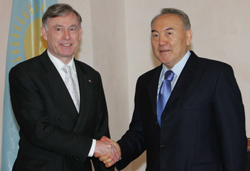 On the same day Head of State Nursultan Nazarbaev met with President Horst Kohler of the Federal Republic of Germany. A variety of issues of strengthening bilateral collaboration were discussed during the meeting.